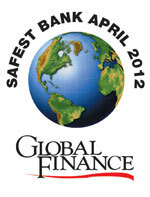 NEW YORK, March 1, 2012 — Global Finance magazine ( GFmag.com ) has named the top 10 Safest Banks In Asia: April 2012 in an exclusive survey to be published in the April 2012 issue. The banks were selected through a comparison of the long-term credit ratings and total assets of the region’s largest banks. Ratings from Moody’s, Standard & Poor’s and Fitch Ratings were used.